We've oft mentioned how much we enjoy faring along with our friends, the Earth Mantra artists, as they travel down their unique path through the world of sound. Even greater is our joy when we can welcome back an artist who has been long away, to again enjoy the music of a friend we have not heard from in some time. 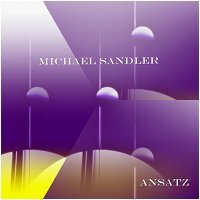 Such is the pleasure we have today, as we release Michael Sandler's first album on Earth Mantra since 2007, a glorious new release called Ansatz. Folks, we have a real treat in store for you today. We have long believed Michael's music to be among the best the ambient world has to offer, but his latest effort knocks the ball clean out of the park. Blending diverse influences, even a touch of 60's psychedelia, this is the kind of music that simply fascinates. One moment an immense unfathomable drone mesmerizes us with lights and colors, the next we find ourselves floating serenely through the depths of intergalactic space, and the next we lay back on our blanket at the outdoor evening concert, shooting stars blazing a path through the heavens to the ebb and flow of the enigmatic music. Masterful. Indeed, one of the hallmarks of this powerful album is the strength of its composition. Michael has always struck us as an ambient musician's musician, someone who really hears what he is playing and finds that zone where everything falls into place. With Ansatz, Michael has elevated this craft to an astonishing level. Put simply, we are blown away by what he has accomplished here. Every piece is so lovingly and carefully constructed, each phrase and section interlocking perfectly with those around them, each transition so precisely measured, that the whole is unified with nary a seam. A majestic achievement by an artist who is not nearly so well known as he should be. So it is our great privilege to unveil Ansatz, the second release by Michael Sandler on Earth Mantra, and the first by him in nearly four years. Certainly one of the most important releases of 2011, and one we are distinctly proud to bring to our audience. In our view, nothing less than music for the ages. This is wonderful music...brilliant stuff!Thanks! I'm too happy to hear new Sandler's release and downloaded it instantly (I try to check EM twice a day, hehe). Previous albums were very good, especially "The Galaxy Project", and "Ansatz" is no exception. All tracks are carefully composed, droney, even psychedelic and really has the mood of relaxed isolation, so to speak, which is my favourite theme in light drone music. I have a tendency to isolate myself from the outer world after workweek, so I prefer these kind of sounds very much.